Perfect costume for babies this Halloween! The Woombie Air is a new breathable swaddle for babies that allows for proper ventilation and helps regulation of body temperature. Swaddling is a great way to help babies sleep and is used to calm fussy babies. The unique peanut-shaped design requires no wrapping and is the safest and most comfortable swaddle for baby. Gently hugging baby to recreate the security and comfort of the womb, the soft 4-way stretch Bebeflex (TM) fabric allows baby to move naturally without pinning baby’s arms to the side. Woombie Air with Tru Air (TM) technology is perfect for all seasons and is super easy to use – just put baby in, zip and snap! No wrapping required. funbites(R) is the first state of the art kitchen tool that instantly cuts kids’ food into BITE-SIZED FUN SHAPED PIECES. funbites(R) is 100% MADE IN THE USA and BPA free. They are perfect to get even the pickiest eaters to try something new and eat healthier. funbites(R) make mealtime and snack time more nutritious, a little easier and a lot more fun. Use on any kid-friendly food from pancakes, fish, cheese, and bread to waffles, watermelon and burgers! funbites(R) are perfect for Halloween too! 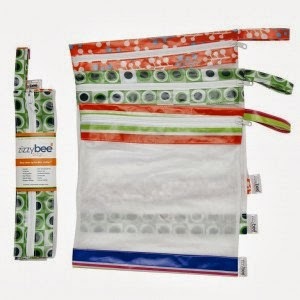 ZizzyBee Bags are fun and attractive eco-friendly storage bags that can be used for a variety of purposes. The compact bags are convenient for every part of your life as they can store and organize just about anything. They come in two eco-friendly bag sizes with a hook for hanging up and a zipper so kids can easily open and close. Moms love that the 100% polyester mesh bags are easy to clean, see-through and are reusable. ZizzyBee Bags are the perfect goodie bag for collecting sweets and treats this Halloween…and for separating and storing leftover candy to avoid sugar overload. Use code zizzyween — BUY ONE GET ONE FREE! Check out their Halloween set: Ghouls Wanna Have Fun. Sleepover, Radioactive, a glow-in-the-dark, and Drama (a new improved shimmer orange) A great way to say Happy Halloween! This adorable toy is perfect for babies and toddlers who are teething. 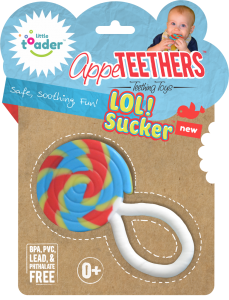 The patented, silicone teething toy is free of BPA, Phthalate, PVC and lead. They provide the perfect amount of resistance to sooth baby’s sore gums, and best of all the cute one-of-a-kind designs will surely make you chuckle! The LOL! Sucker looks just like a real lollipop! While it safely and effectively soothes baby’s sore gums, it will look like your baby is enjoying Halloween candy just like the rest of us!